When shopping at Trader Joe’s, I saw them giving out samples of their pumpkin cheesecake. I was surely sad that I couldn’t try a bite. So I came home, roasted a few pumpkins and decided to do some experimenting. I was so pleased with my dairy free “cheesecake”, that I made another one to try out on friends and family. I got very positive feedback, even from my husband who is one tough critic. This recipe is egg-free, dairy free, gluten free, grain free, and sugar free. But not free of a creamy texture and bold flavors. If you have not ventured into the world of cashews as a dairy replacement, I suggest you make this recipe. I think you will be surprised at how much this really tastes like cheesecake. You won’t know unless you try! 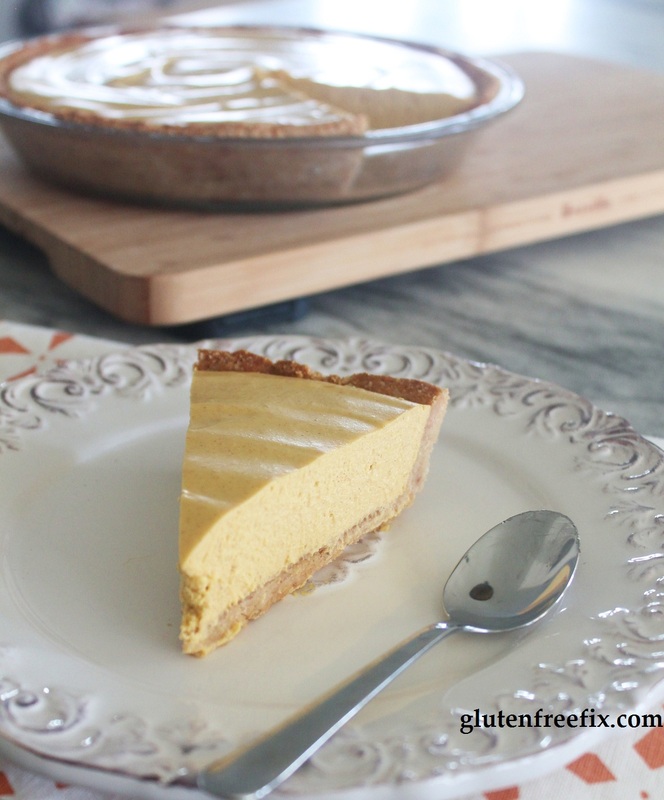 Try it with your favorite gluten free pie shell or my Easy Graham Cracker Crust. Combine all ingredients in a high powered blender. Blend on high until smooth and creamy. Pour mixture into fully baked crust. Place in freezer to set (at least 2 hrs). Keep in fridge until you are ready to serve. Well this was super easy to make! Thanks Michelle. You know when you bite into a carob chip, expecting chocolate? That’s what I thought of when I dipped my finger into the pureed filling :) I was expecting the “usual” overly-rich pumpkin pie filling. This one is GOOD, but definitely _different_ than what I was expecting. When you use coconut oil is the measurement for melted or solid? Thanks! The measurement is from a liquid state. Be sure to come back and tell how it turned out for you! Okay…I made this and I used the coconut oil as a substitute for butter. First…this was so easy to make and I love that once I baked the crust, I was done with baking. Second….I haven’t had a good dessert in a LONG time and this was incredible! Third….I won’t be making this often, because I discovered that I really like it for breakfast….and well, really I shouldn’t be eating it for breakfast. But it was so yummy. My recipe calls for fresh cooked pumpkin puree or canned (which is cooked during the canning process). 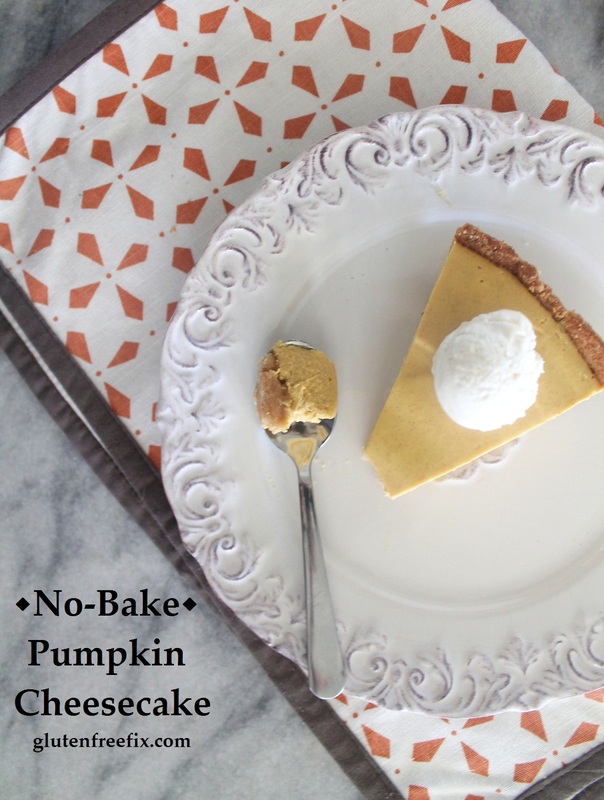 If you attempt to make this with raw pumpkin, I would love to hear about your creation! Good luck! Rowena, I think the pumpkin was supposed to be cooked! I made this with a can of “Libby’s 100% pure pumpkin” which I think is not cooked. And even though I put it in my food processor (Cuisinart) for a while, it never got that super creamy texture in the picture. Also mine was darker, like the color of a pumpkin pie. But to be honest, it STILL tasted great! So while it wasn’t “cheesecake” it was still a really good pumpkin pie. I’m so happy I can have gluten-free pumpkin pie! Thank you Michelle! If I used actual cream cheese instead of cashews, how much would I need? Most local health food stores and Whole Foods and Trader Joe’s carry them. If those stores aren’t available to you, I suggest purchasing your raw nuts online. Good luck! Hi, this looks delish, but I live in southern Italy and we don’t get graham crackers here. Could you recommend an alternate crust recipe? Your recipe is not soy free so if there is no soy allergy can’t you make cheese cake with the tofutti cream cheese? That’s what I’ve done and have been able to offer all kinds of desserts to my dairy allergic daughter. They also have tofutti sour cream which I use in my pumpkin pie recipe. I think you meant to say that this recipe IS soy free? Yes, all of my recipes are soy free- I have not worked with Toffutti cream cheese so I can’t guarantee the success of the recipe using the substition. If you try experiment with it, I’d love to hear your results and I’m sure others would as well! What was the substitute if you cant eat cashews? Any suggestions? I run into this with a lot of gluten free dairy free recipies, and don’t make them because of the cashews. How about cornstarch? Hi! I would love to try this recipe but I have a coconut allergy. Is there another option for the coconut oil? 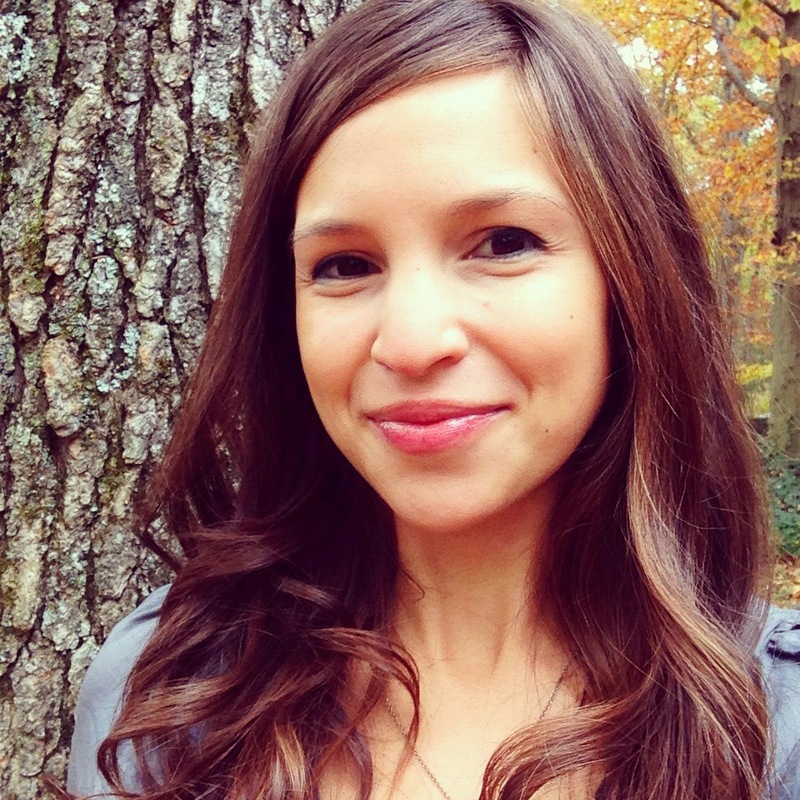 I have heard of people using cacao butter to replace coconut oil in recipes. I haven’t tried it yet, so I can’t guarantee the end result. Please be sure to let us know if you try it. I am vegan so would need to replace the honey. Do you think agave nectar would work just as well? Thanks. 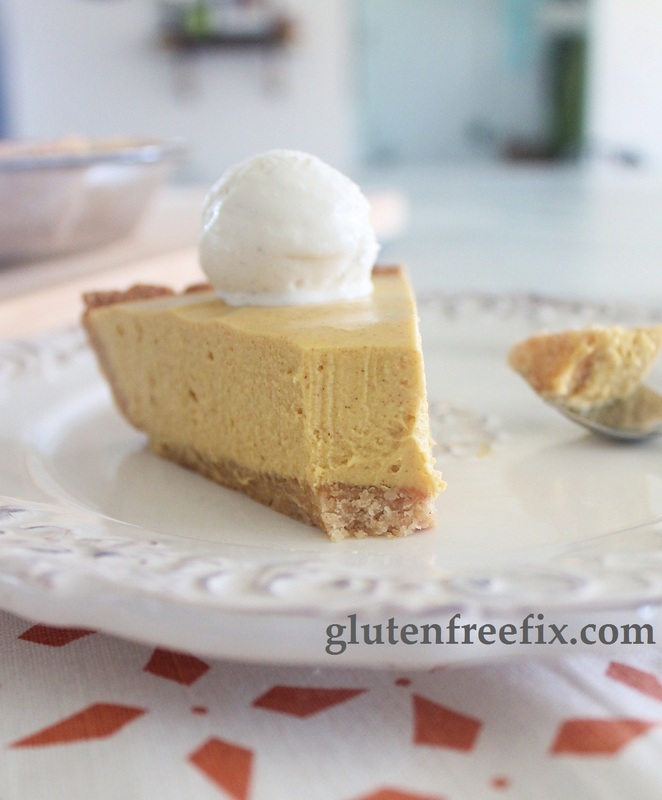 Where did you find a gluten free fully baked Easy Graham Cracker Crust? All of them I could find had wheat flour in them, which contains gluten, unless it says Gluten free. I checked Trader Joe’s in my area as well. Didn’t have time to look & order online. I did not find gluten free crust, of any kind, ready made anywhere in my area. This will be one of my first GAPS desserts. It looks so amazing. One thing, you might want to specify that your “Easy Graham Cracker Crust” is GAPS too. I found it pinned and the commenter said, they would have to make the crust GAPS legal. I would also like a substitute for cashews. I would love to try this. My younger brother is deathly allergic to cashews so I can’t have them in the house. What do the cashews do in this recipe and can I substitute them for something else? Or… should I just try taking them out? I’m new to baking and I don’t bake with nuts because of my brother so I’m not sure I know how to work around this issue on my own. Help? The cashews + pumpkin are the main part of the filling. The soaked pureed cashews + lemon juice replace cream cheese used in traditional recipes. I think you might need to find another filling recipe if you can’t use cashews. THis was so easy and fun to make!!! Upon tasting the finished product, however, it seemed very tart and the lemon was pretty strong. I did everything exactly as you instructed…not sure what went wrong??? Should I just cut down on the lemon next time? I used a regular blender, not a vitamix. Thanks! P.S. Love your graham cracker crust recipe! Hi, I’m excited to try your recipe, however I’m not sure how to work with coconut oil as it is a combo or liquid and solid. Please advise, thanks! This was kind of hit-and-miss here. I made it for Thanksgiving along with a dairy-free no-bake cheesecake with blueberry topping that I veganized from the classic condensed milk version. Of our family of 7, everybody preferred the blueberry pie way more except for my husband, who was nice and offered to just eat the pumpkin cheesecake so there would be more of the other kind for the kids. He really liked this recipe, but he didn’t get to taste the other one so I don’t know if he would have liked it best. I agree with the commenter who said that it takes you by surprise at first because you expect it to taste more of pumpkin and traditional pumpkin pie. It does taste more like cheesecake than pumpkin pie, although it’s not quite cheesecake either. I definitely tasted the coconut oil — more so in texture (that classic cold coconut oil mouth-feel) and I didn’t care for that. I also really craved more pumpkin flavor. I used home cooked pumpkin and I wonder if canned would be better because it tends to be more concentrated. I added the lemon juice a tablespoon at a time and tasted each time, because of one comment about the lemon being too strong. I found that I needed all three TBS for the cheesecake flavor. Having less didn’t make it taste more of pumpkin, it was just more plain that way. It did set up beautifully, and cut perfectly. We thought a chocolate drizzle might be good on it, too. Thank you so much for this recipe! It is so delicious! I subbed the honey for maple syrup and brown sugar. I also added a dash of pumpkin spice to add some cloves into it. I will be making it again and again. Don’t understand how this recipe is gluten free if it’s made with graham cracker crust. The filling sounds like it would be a great dessert. Please, how I’d this Gluten Free, as advertised directly on Pinterest headline?